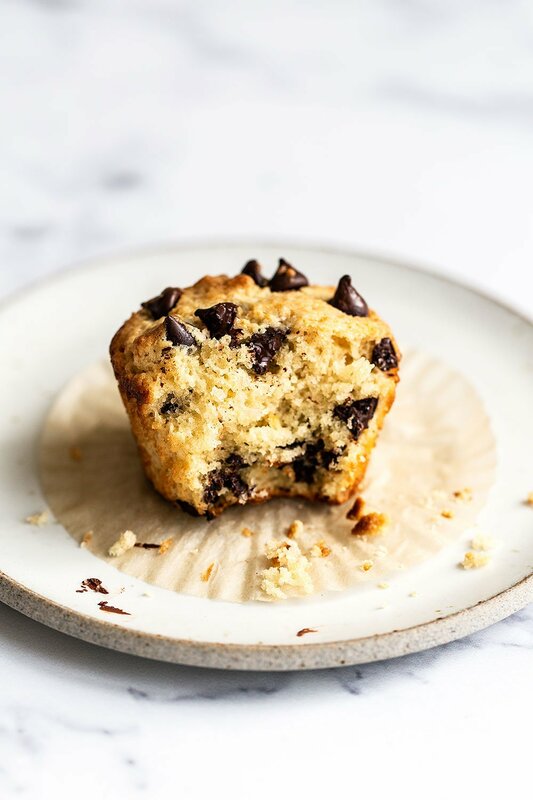 The BEST Chocolate Chip Muffins are moist and tender with buttery slightly crispy edges and tons of gooey chocolate chips throughout. 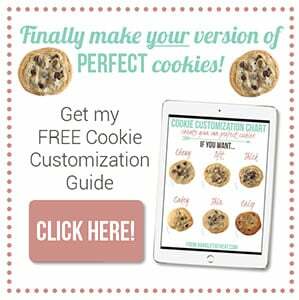 Download my free Ultimate Muffin Guide here! There’s something so satisfying about the simple muffin. I love that it can be enjoyed for breakfast, as a snack, or as a dessert. These chocolate chip muffins use an extra dose of brown sugar to give it that slightly butterscotch taste that pairs so well with the chocolate. They also have a generous amount of butter which not only makes them taste amazing, but helps to create those slightly crispy muffin tops. This recipe is simple and unassuming but absolutely satisfying. I first published a version of this recipe almost TEN years ago and it’s actually evolved a fair amount since then. I think that just goes to show that the most minor tweaks and changes can make a big difference in the final result when it comes to baking. How Do I make MOIST Muffins? In addition to the tips below, be sure to measure your ingredients properly. Especially your flour. It’s ridiculously easy to accidentally add too much flour when using measuring cups. I like to use the spoon and level method or better yet, a digital kitchen scale. 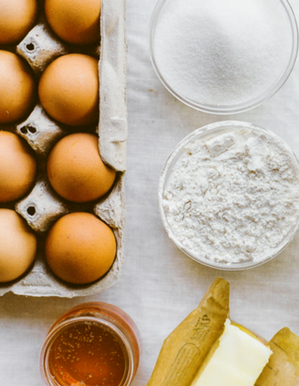 Learn more about the importance of measuring flour correctly here. Do I have to use buttermilk? For best results, yes. Real buttermilk makes a difference. If you don’t have it on hand, you can use whole milk instead. 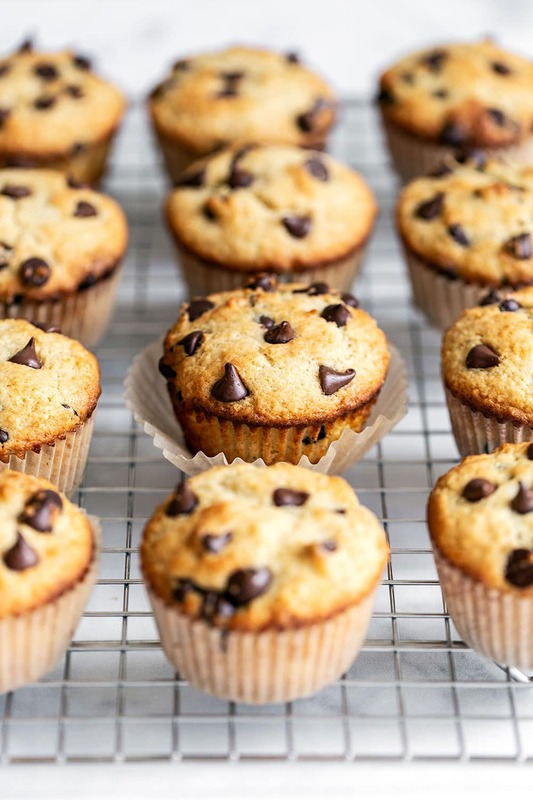 In my Ultimate Guide to Muffins I tested side-by-side muffins made with milk vs. buttermilk. What I found was that the buttermilk created a more moist, tender, and flavorful muffin. If you’d like to learn more about the science of buttermilk in an easy visual way, including buttermilk substitutions, check out my Buttermilk 101 article. This will create dense or rubbery muffins which no one wants. Once the dry ingredients are combined with the wet, gently stir with a rubber spatula *just* until it’s combined. Since we’re adding in chocolate chips next, I actually like to leave a few streaks of flour. They’ll get stirred into the batter with the chocolate chips. You may have seen that trick for getting muffins to bake up nice and tall? The one where you start the oven out on a high temperature for a few minutes then reduce the temperature? That technique definitely works, but I almost always forget to lower the temperature so I went ahead of simplified things for this recipe with just one temperature. This recipe uses a generous amount of butter which helps produce slightly crispy edges on the muffin tops. That’s my FAVORITE part. However if you like a paler muffin then feel free to shave a couple minutes from the baking time. Just note that the darker your muffin tin the more brown your muffins will get while baking. This is my favorite muffin tin to use. Why Do My Muffin Liners Stick? Oftentimes this is due to the brand of liners. This is my favorite brand that I order in bulk from Amazon. If you find your liners still get stuck and end up ruining your muffins, don’t worry. I’ve actually written an entire article about how to prevent muffin or cupcake liners from sticking here. Store in an airtight at room temperature for 3 days. Reheat in the microwave for about 15 seconds if desired to get the chocolate chips nice and gooey. Muffins can also be frozen in an airtight container for up to 3 months. Defrost on the counter or in the microwave. Preheat the oven to 400°F. Line a standard muffin tin with paper liners. In a large bowl whisk together the flour, sugars, salt, and baking powder. In a small bowl whisk together the buttermilk, butter, egg, and vanilla. Pour into the dry ingredients and stir with a rubber spatula until just combined. Gently stir in the chocolate chips. Do not overmix. Divide evenly among the muffin tin cups. Bake until golden brown and a toothpick inserted in the center comes out clean, about 20 to 22 minutes. Let cool until barely warm. Serve or store in an airtight at room temperature for 3 days. Reheat in the microwave for about 15 seconds if desired. Muffins can also be frozen in an airtight container for up to 3 months. If you make this recipe, be sure to snap a picture and share it on Instagram with #handletheheat so we can all see! This recipe was originally published in 2009 (!) and recently updated with recipe improvements, tips, and new photos. Photos by Ashley McLaughlin. 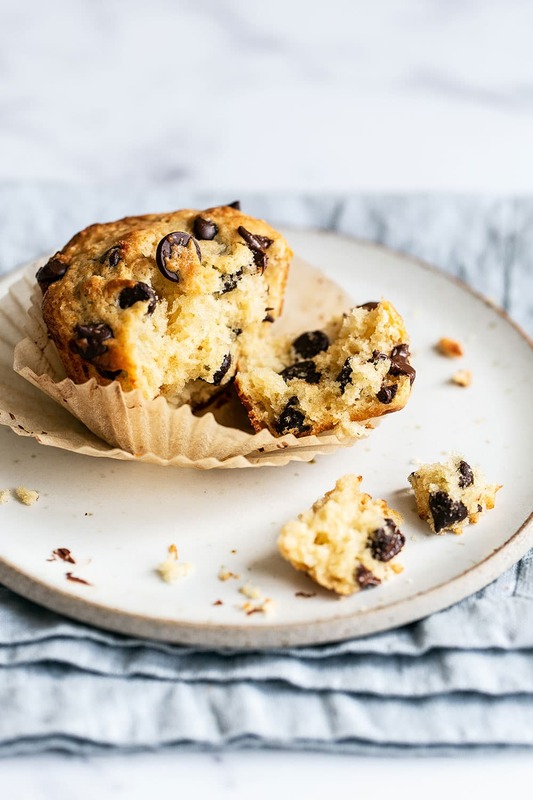 I love chocolate chip muffins and these look fabulous! Yum! Your muffins sound delicious! The chocolate might have stuck with the PAM depending on the type of coating on the pan. I find that greasing and flouring the pan typically works better than sprays when it comes to baked goods. okay, so clearly you are also having a bit of a muffin obsession yourself. You know what, this post made me realize that I have never actually baked chocolate chip muffins myself. I think I am going to make these into some mini muffins. Nice! If all your muffins look like that, keep making them. Yum! Tessa these muffins looks delicious! By the way this is Lauren A from TJB! You can never have too many muffins! 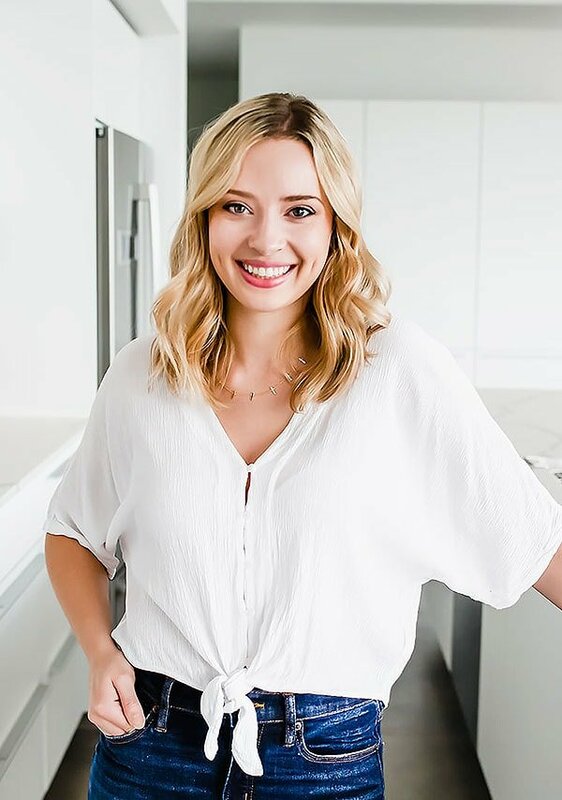 Thanks for the recipe Tessa! These look so goood!! I'm actually drooling haha. jus made these…came out perfect except for the sweetness in the muffins…i think the recipe requires more sugar. I read somewhere else that if you dredge ever so lightly the chocolate chips before adding to the dough it helps “lift it up”. My 8 year old asked for chocolate chip muffins this morning. I made this recipe and the kids had them for their after school snack. They devoured them! Yummy muffins. I am now making these muffins a fourth time! It is a great recipe. We also like it with blueberries in it instead of chocolate chips! I just made these and they were delicious and a big hit at my house! I just made these muffins and they are to die for!! So light and fluffy and so yummy! I just made these tonight for a snack and they r fabulous. I sprinkled sugar on top just before they went in the oven and they are a hit. Thanks for the recipe! 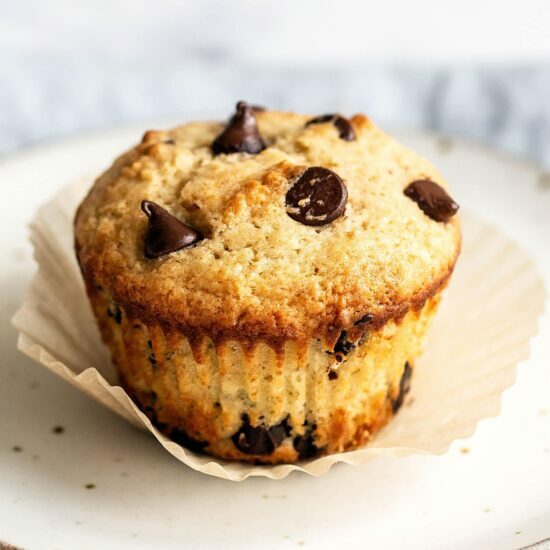 I just made these muffins and they are absolutely delish!!! Will definately be making these again ~ maybe tomorrow – because I don’t think these will last long in my house!! How about using mini muffin tin? Anyone tried it? Just wondering if they would turn out just as good as regular. I liked the muffins, but something about them was not right – maybe the consistency. Loved the muffins but I agree with Gila, the consistency is a bit of. They are delicious but not dense like muffins should be. They are a tad “airy”. What can I change to make it even better? Use cake flour? Came out great! I love this recipe! I made the recipe and it was super was super easy to put together. I was also happy with the texture with the muffin. It was super light. I just found it lacked a little in flavour. I might just bump up the vanilla next time or might even try browning the butter to see if that will elevate it to greatness (In my eyes at least). Don’t get me wrong it was a good muffins just not as great as I think it could be. 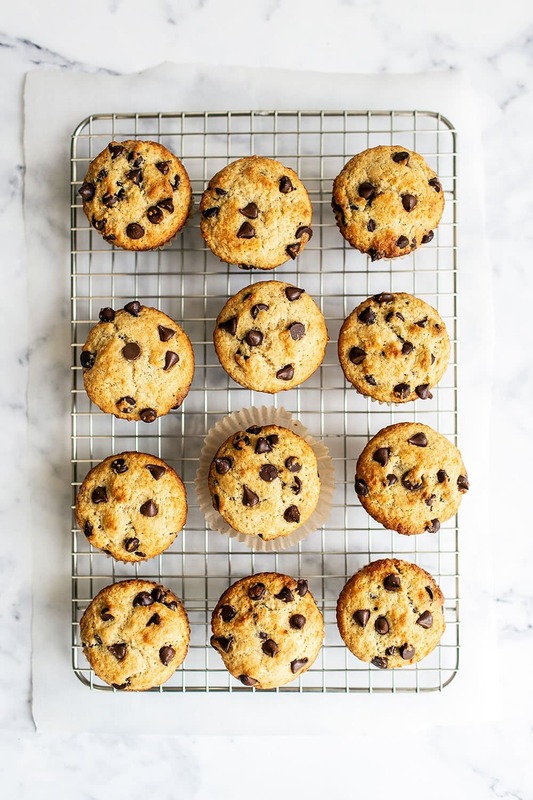 Pingback: Chocolate Chip Coconut Muffins | Are We There Yet?